Celebrate your love with this breath-taking 18ct yellow gold eternity ring. The beauty of this eternity ring is something to marvel over and guaranteed to bring a smile to your partners face. Embellished with three rows of stunning diamonds totalling 1 carat, this ring exudes luxury. 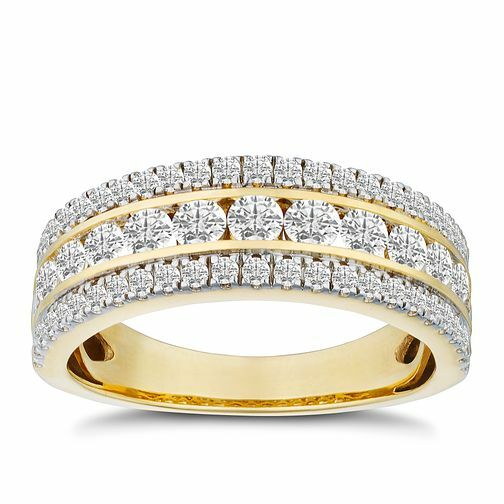 18ct Yellow Gold 1ct Diamond Three Row Eternity Ring is rated 5.0 out of 5 by 4. Rated 5 out of 5 by Anonymous from Beautiful! A really nice ring, looks really elegant and the wife loved it! Rated 5 out of 5 by Anonymous from Service from Earnest Jones was excellent. The quality was as hoped for and the delivery was on time.